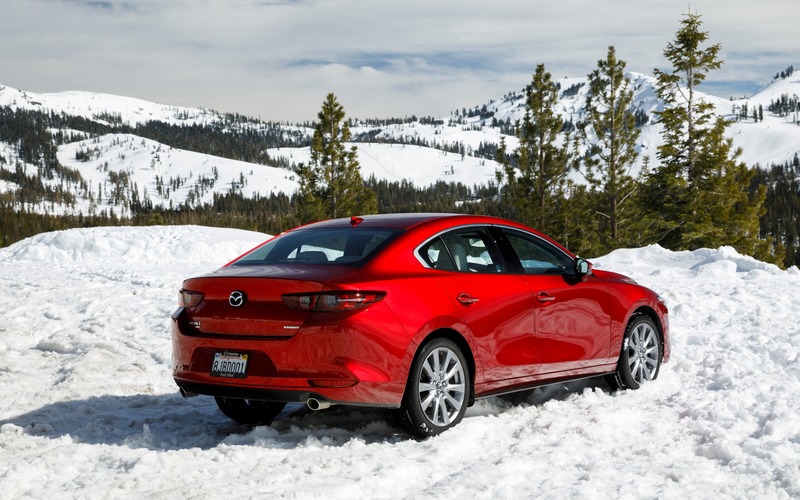 Mazda caught the attention of many drivers in Canada with its decision to offer an all-wheel-drive option with the new-generation 2019 Mazda3. Other than the Subaru Impreza and more expensive models like the Volkswagen Golf R and Mercedes-Benz A-Class, compact cars equipped with AWD are few and far between on our market. Also: 2019 Mazda3: This is It! The big question is: will the newly armed and more dangerous Mazda3 manage to regain the market share it has lost over the past few years? 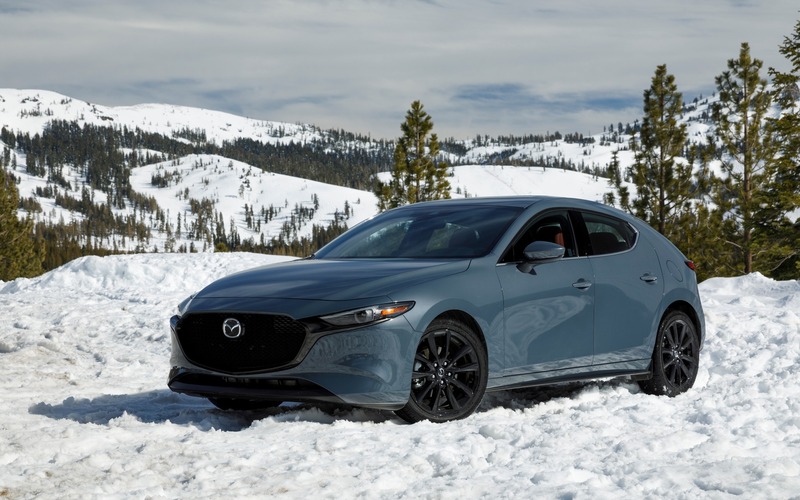 The Car Guide’s first experience with the 2019 Mazda3 AWD took place in the surprisingly snowy mountains around Lake Tahoe in Northern California. 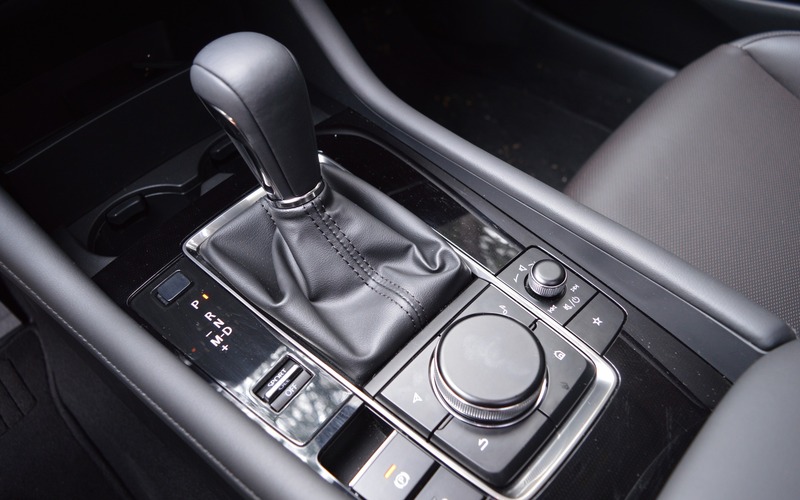 The car revealed itself as a competent performer on slippery surfaces thanks to the Japanese automaker’s i-ACTIV all-wheel-drive technology. Before going any further, we must tell you that this isn’t a full-time AWD system like the one found on Subaru vehicles. In normal conditions, the Mazda3 AWD sends power to the front wheels only, but as soon as one of them starts to slip, some of the torque is transferred to the rear wheels. We were already familiar with the benefits of Mazda’s system in crossovers like the CX-5 and CX-9, and it didn’t disappoint with the little Mazda3. Whenever the car starts to lose grip, the rear axle comes alive and works to deliver optimum traction in corners. What’s more, fuel economy is only marginally affected: the 2019 Mazda3 AWD burns just 0.4 L/100 km more than a regular, FWD-equipped version with the same engine. By the way, the AWD option is available with the 2.5-litre engine and automatic transmission exclusively—not the base 2.0-litre mill or manual transmission. Consequently, you will have to pay at least $26,000 for a four-door Mazda3 AWD and $27,000 for the five-door Mazda3 Sport AWD hatchback, excluding freight and delivery charges. These prices are significantly higher than the base MSRP of $18,000. 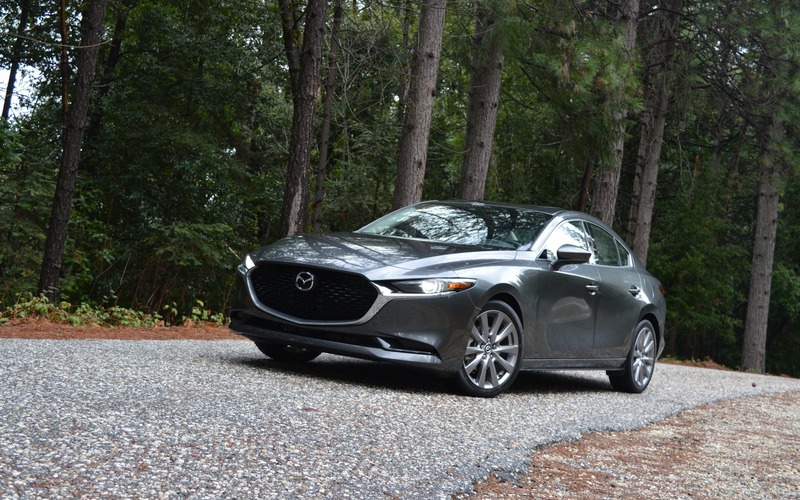 Unsurprisingly, the new AWD system in the 2019 Mazda3 generates plenty of interest, but it’s far from the only feature that’s worth paying attention to. As mentioned, the Mazda3 is all-new for 2019, with a boldly revamped exterior that’s particularly attractive in the case of the five-door model. Designers stayed true to the stunning Mazda Kai concept unveiled in 2017. Both the sedan and the hatchback maintain a focus on emotion to win over customers. The 2.0- and 2.5-litre four-cylinder engines are returning with 155 and 186 horsepower, respectively. This Japanese compact has never been the most spacious or the most affordable in its class, but Mazda prides itself on offering the most engaging and rewarding car for drivers and the latest generation pulls it off even more resoundingly. 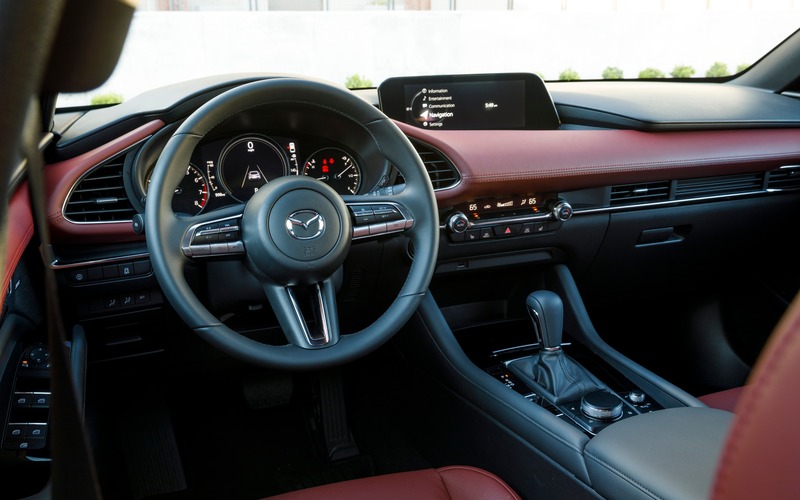 Inside the 2019 Mazda3, you can’t help but be impressed with material selection and ergonomics. There’s now a world of difference between this model and traditional rivals like the Honda Civic and Toyota Corolla. At last, Mazda’s infotainment system is compatible with Android Auto and Apple CarPlay. You can access it through a new 8.8-inch display that was moved further away from the driver to prevent distractions. The rotary dial located on the centre console is the only way to control it. Front-seat comfort is adequate, although we would have liked some height adjustability for the passenger. In the back, the sloping roofline severely compromises headroom. No big deal. The Mazda3, after all, is a driver’s car first. Just take it for a spin and you’ll see how impressive it can be—even with all four wheels in the snow. 7/10	The numbers aren’t so bad, but the Mazda3 burns more fuel than most competitors. 7/10	The lack of a height-adjustable front passenger seat is regrettable. Also, rear-seat headroom is limited. 8/10	The available 2.5-litre engine makes the Mazda3 a strong performer. 8/10	A significant improvement over the previous generation. Android Auto and Apple CarPlay compatibility is standard. 9/10	This is where the Mazda3 truly stands out. With exemplary handling and sharp steering, any driver will fall in love with it. 8/10	A no-brainer for compact-car buyers who primarily want to have fun behind the wheel. 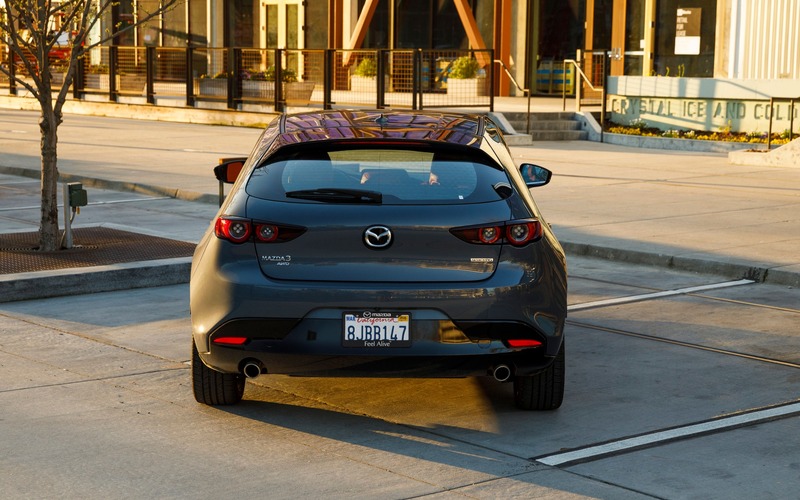 Los Angeles 2019 Mazda3: This is It!